I love visiting food blogs specifically looking for something to prepare for dinner…”tonight”! The other day I visited one of my favorite blogs (I have too many to count) and found this recipe. I am a huge fan of Molly’s blog and I took heed to her urgency about cooking this pasta. I ran out and pick up what I needed, came home that late afternoon and made one of the most delicious pasta dishes we have ever had. I never imagined pasta prepared with yogurt sauce. 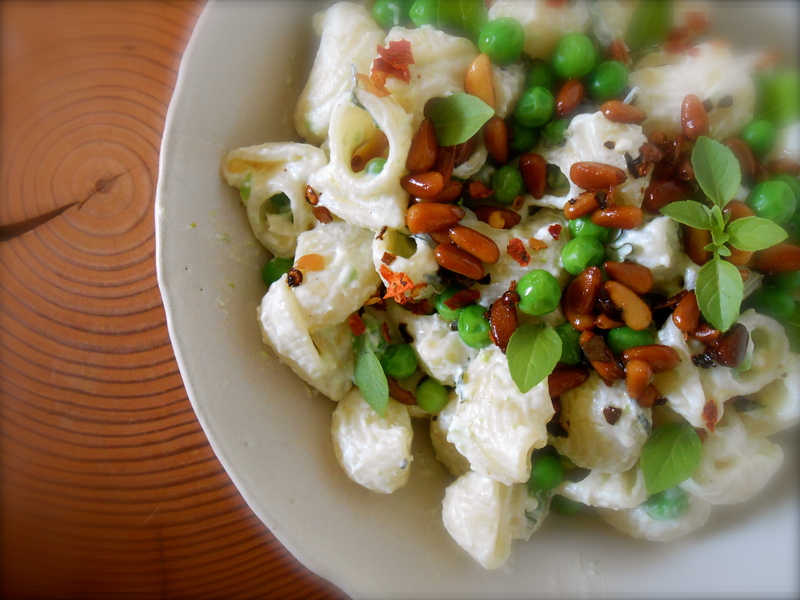 This was so creamy, yet light, a bit spicy from the chile, yet a little sweet from the peas, nutty from the pine nuts and lightly salty from the feta. All melty hot and delicious. I have yet to pick up my copy of Jerusalem, by Yotam Ottolenghi and Sami Tamimi. Convincingly after making this recipe I am heading out today to do so. I could never in my wildest dreams come up with this so I am giving you Molly’s posted recipe “verbatim”. And if you haven’t read Molly’s book A Homemade Life it is quite charming and features some incredible recipes. A s w r i t t e n o n O r a n g e t t e . . . .
Looks wonderful, I made something very similar the other day using fusilli, I love that you used yogurt and the chili flakes. I love cold pasta salads!! This really is a wonderful recipe Suzanne. It is actually not a cold pasta salad rather a warm pasta. I know with having yogurt in it would seem like a cold salad. I have never tried anything like this before and it shall be in high rotation around here. Yes, I thought because of the yogurt it would be cold. Either way cold or warm it sounds wonderful. This looks yum Seana – the only part I’m not keen on is peas – they’re something I could never convince myself to enjoy. I wonder what can be used to substitute them? And, please let us know how the book Jerusalem is – if it’s any good, I’ll get a kindle version of it! thanks dear! Hmmm. Not sure about a substitution for the peas. Maybe fava beans? I would be willing to try fava’s with this and let you know. I loved this so much I could eat it quite often. I’ll let you know my opinion about Jerusalem…I’m sure it is amazing! I know! I still didn’t go pick up “my” copy. It is definitely the next book I buy…Let me know if you get it first! Cold pasta dishes are one of my favorite go-to recipes. I like the different ingredients in this dish though. I’ll definitely give it a try very soon! I am going to have to make this soon. Thankfully Dreamfields makes a great gluten free low carb pasta so, I’m in! It looks absolutely delicious. Thanks for sharing Orangette, I had not discovered it yet and am looking forward to reading more! I do have the Jerusalem cookbook and I love it! I had book-marked this very pasta dish… I think I may have mentioned before that we would get along just fine, no? Really? We do think alike! I still have not picked up a copy but guarantee I will! Now you have to make this. You’ll love it Lidia. What a great salad! I love Ottolenghi :) thanks for sharing a wonderful recipe! It’s unlikely, but I happen to have all thee ingredients in our kitchen right now! dinner! I love the “Orangette” blog as well. I read her book from the library a while back… Have you been to Molly’s restaurant? I think it’s in your end of the country. Oh good Rhonda! Hope you make this, you’ll love it. Yes! I have been to Delancey’s they serve fantastic pizza! Molly has such a wonderful writing talent and I love her palate. Amazing recipes. Let me know if you make the pasta! I use yogurt in lots of recipes but have not used it in a pasta recipe like this. It sounds great and I can’t wait to try it. This was a first for using yogurt for me too. It really is delicious Karen, definitely worth trying. Like Karen I’ve never cooked yoghurt with pasta. Love the idea of using fresh peas that are available in the shops right now. And I need to use up some of my Greek style basil! Yes! And I remember you featuring this basil a few weeks ago. I ended up finding a great source at the market a couple of weeks ago. It seems to be much more intense than, say the genoa basil. Hope you give the recipe a try, I certainly can not take credit for it deliciousness…just passing the goodness of it on! Wow, the pasta dish looks really really delicious. I’ve never had pasta with yogurt before ( I think!) I would love to check this out. Thanks! :) You’d be pleasantly surprised how delightful yogurt with pasta is! Delicious. This sounds delicious. When I first read the ingredients, I though this was to be served chilled, like the commenter before me, I’ve not had a hot pasta dish dressed with yogurt. This makes me want to try it even more. I never considered it may appear as a chilled pasta salad until I received a few comments. :) Maybe I’ll go back and edit the post a little… I was so enamored with this recipe John! You’ll love it too, I know. this pasta looks absoutely incredible. i’ve been on a big yogurt kick lately, and now that i made a big batch of lebaneh the other day, i’m thinking i might be uniquely suited to making a variation on this dish. when i finally get around to making it i’ll probably add roasted red peppers or sundried tomatoes, but otherwise it looks like it is right up my alley. beautiful work as always. Oh my your own lebaneh. Sounds like you have just stepped this recipe up several notches. I can taste the sundried tomatoes or roasted peppers in this…would be a perfect variation. Your comments are so kind and encouraging. Thank you so much. I am still trying to imagine what it must be like stepping out your door every morning and receiving a greeting from Mt. Fuji! looks awesome! Yes, I concur about getting Jerusalem. I made the spinach salad w/ dates and almonds (found on a blog) twice this past week it was so amazing. You’re welcome. If you don’t have sumac (like I don’t, and surprisingly enough couldn’t find at a couple of stores) try lemon pepper seasoning. That’s what I used and it still had a really complex flavor (would love to get my hands on sumac though). I’ll look for it today while at the market. Thank you! I never had pasta with yogurt before but it sounds delicious and looks very summer-y too. YUM! Thank you Sarah. Keep your eye out for this little basil varietal. This is the first season I have seen it. I have seen it available as greek basil or bush basil. It is quite remarkable, you have to see it…do a quick google image search. You will be impressed. I would love to make this too! Yummy! This dish looks great! You could also use some ricotta cheese instead of yogurt and serve it warm. Lovely post. This looks delish. Greek yogurt is great warmed up, on pasta, on rice, in tomato sauce, you name it! I’m looking forward to trying this particular dish! It really is delicious! I’m going to make it again this week. I have been using enormous amounts of greek yogurt these past several weeks. We love it. This looks fantastic! I love peas in my pasta dishes. I also have a guilty little pleasure of mixing in some sour cream in any leftover pasta, so I think I will adore this dish. Thanks heaps for sharing! I think you and I think alike. :) This pasta dish has all the great elements and textures to it. It’s so good! Just made it for dinner and it was fantastic! I had to use ricotta instead of yogurt though as I used up all my yogurt making panna cotta… this pasta dish really was amazing. Thanks again! Parsley maybe. Thanks for your speedy response! You are currently reading conchiglie with yogurt, peas and chile at COTTAGE GROVE HOUSE.